After a disaster, you often need to recover a virtual machine (VM) in the shortest amount of time possible, whether for the purposes of re-starting business-critical applications or recovering files. Regular recovery of the entire VM can take too long for businesses that need to urgently resume operations. To let you recover VMs on an immediate basis, NAKIVO Backup & Replication offers the Flash VM Boot feature, which supports both Hyper-V and VMware platforms. Flash VM Boot provides the possibility to instantly recover a VM directly from a compressed and deduplicated backup without affecting the backed-up data. You can use the VM recovered with Flash VM Boot for sandbox testing, browse and recover VM files, or migrate the VM to production. The main components of NAKIVO Backup & Replication are the Director and the Transporter. The Director is used for managing data protection operations, while the Transporter is used for data transferring, compression, encryption, and deduplication, as well as the processes for backup, recovery, or replication. When you run Flash VM Boot, you should specify the Hyper-V server on which you want the VM to run. Flash VM Boot creates an empty VM without any virtual disks on the target server. The NAKIVO Backup & Replication Director requests the Transporter to expose the VM virtual disks from the backup repository as iSCSI targets. These disks are mounted by the Director to the previously created VM as pass-through disks. The changes in the VM recovered by Flash VM Boot don’t affect the backed-up VM stored in the backup repository. The disk-based write cache in the backup repository is used to store the changes made within the recovered Hyper-V VM. When the Flash VM Boot job is stopped, the changes are discarded. If you want to keep your changes, you can migrate the VM using regular Hyper-V tools. Let’s consider several cases in which Flash VM boot for Hyper-V can be used. Temporary recovery of a VM after a disaster, before the production environment can be recovered. Recovery of the whole infrastructure that is used in production may take a long time. 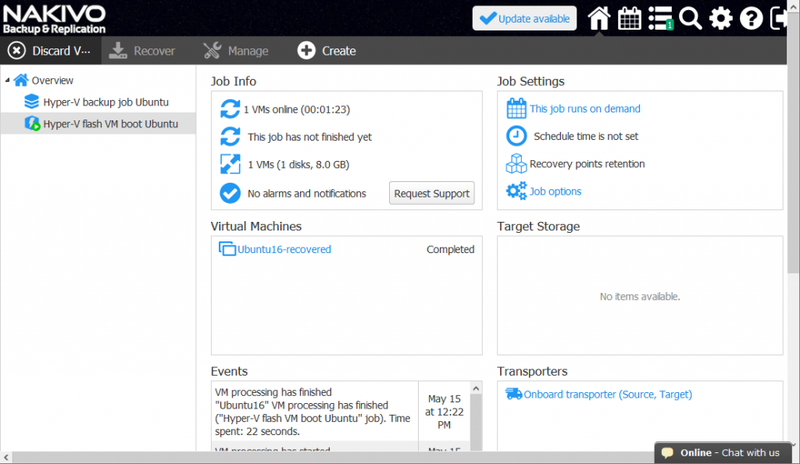 With Flash VM Boot, you can instantly recover a VM from a backup to a temporary environment and use this VM while the production environment is being recovered. Further migration to the production environment can be performed afterwards. Access to files, directories, and application objects. For example, you can load the VM, run an application, and export some of the application data. Manually copying such files, as well as converting them, would be difficult. Test your VM to ensure that applications function after recovery. Just recover the VM using Flash VM Boot and check whether everything works fine. This way, you can avoid a situation where a backup is created successfully, but some data is corrupted (e.g. due to a disk error). Test a new system update before installing the update on the production VM. In this case, you can select the recovery point of this VM from the backup repository and recover the VM to a temporary environment with Flash VM Boot. Install the updates, check that everything works fine, and then discard the VM recovered with Flash VM Boot. Flash VM boot is also used by another feature called Screenshot Verification. The following is a Flash VM Boot walkthrough with screenshots. First, open your browser and navigate to your instance of NAKIVO Backup & Replication. From the main interface, click Recover, then select Flash VM Boot. Select your backed-up VM. In this example, Ubuntu16 is the backed-up VM. Then select the recovery point of your choice and click Next. Click a VM name to expand the extended VM settings. Click Next when all the settings are configured the way you want. At the Schedule step, you can set scheduling options or opt to run the Flash VM Boot job only on demand, as was done in this example by checking the box (see the screenshot below). 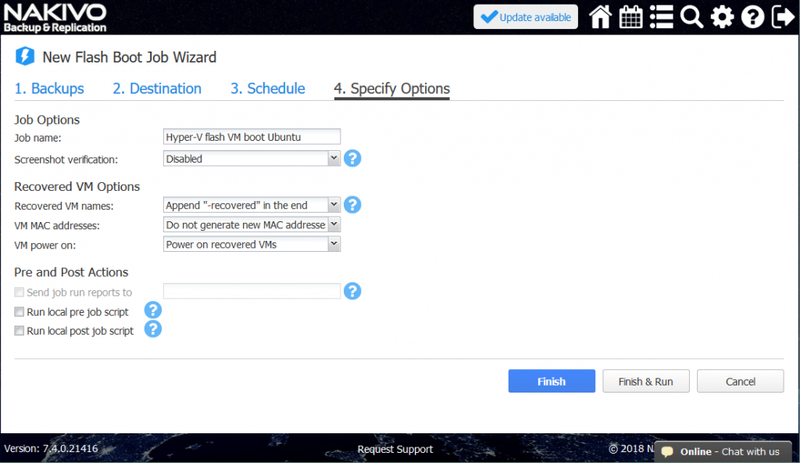 Specify the job options for the Flash VM Boot. You can specify the VM name and other options, as seen on the screenshot below. Select Power on recovered VMs. When you are ready, click the Finish & Run button. When the VM is no longer needed, you can discard the VM. Simply click the Discard VMs button. 1. Shut down the VM in the Hyper-V Manager. 2. Go to the VM settings and make a note of the name of the physical disk from which the VM was booted. Change the VM disk settings as follows. Under Media, select the Virtual hard disk option instead of Physical hard disk. Create a new VHDX virtual disk and select Copy the contents of the specified physical disk in the Configure disk section (select the physical disk name you recently noted). 3. 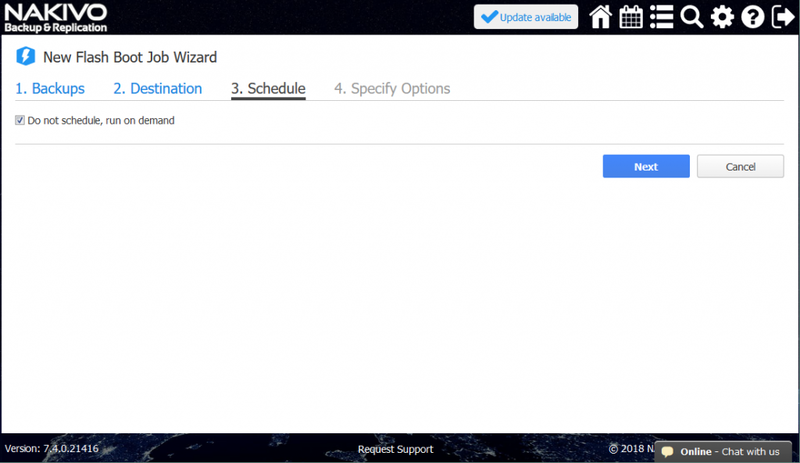 Move the VM you have modified to another location using the Hyper-V Manager. 4. After the VM has been moved, discard the VM in the Flash VM Boot options of NAKIVO Backup & Replication. 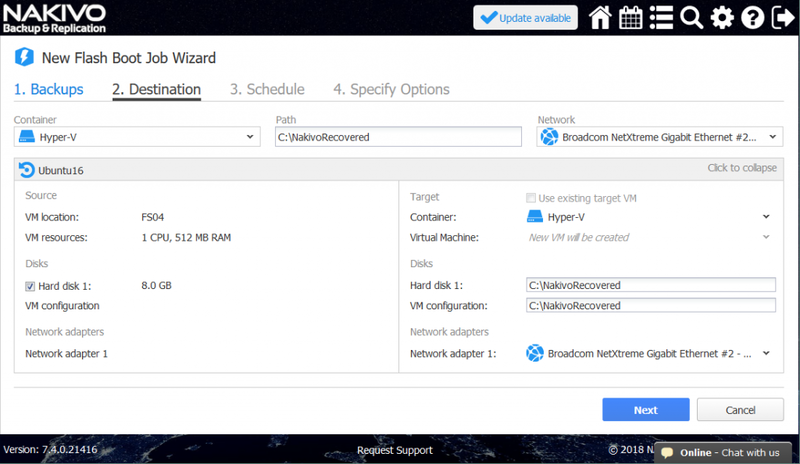 The Flash VM Boot feature of NAKIVO Backup & Replication can help you to near-instantly recover Hyper-V VMs. The main difference from regular VM recovery is that Flash VM Boot consumes significantly less time. This is achieved because the VM is booted directly from a compressed and deduplicated backup stored in the repository (without affecting the backup). Because you don’t need to extract and copy the VM data from the backup, you can recover the VM in the shortest time. 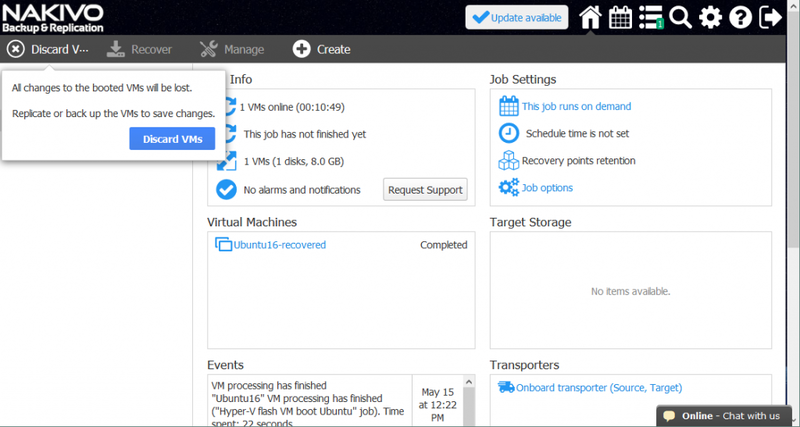 You have the option to save changes and migrate the recovered VM for permanent recovery. Flash VM Boot can be used for recovery of files and application objects, as well as for testing purposes.